This section will go over the concepts of A-Frame’s primitive elements and their relation to the entity-component framework. If you’re looking for a guide on using HTML and primitives, check out the Building a Basic Scene guide. A-Frame is based on top of HTML and the DOM using a polyfill for Custom Elements. HTML is the building block of the Web, providing one of the most accessible computing languages around. There are no installations or build steps required, creating with HTML involves just text in an HTML file and opening the HTML file in a browser. Since most of the Web was built on top of HTML, most existing tools and libraries work with A-Frame including React, Vue.js, Angular, d3.js, and jQuery. If you don’t have too much experience with HTML, no problem! It’s fairly easy to pick up and perhaps even easier to grasp than 2D HTML. Once you pick up the general structure or syntax of HTML (opening tag, attributes, closing tag), then you’re good to go! Read an introduction to HTML on MDN. While the HTML layer looks basic, HTML and the DOM are only the outermost abstraction layer of A-Frame. 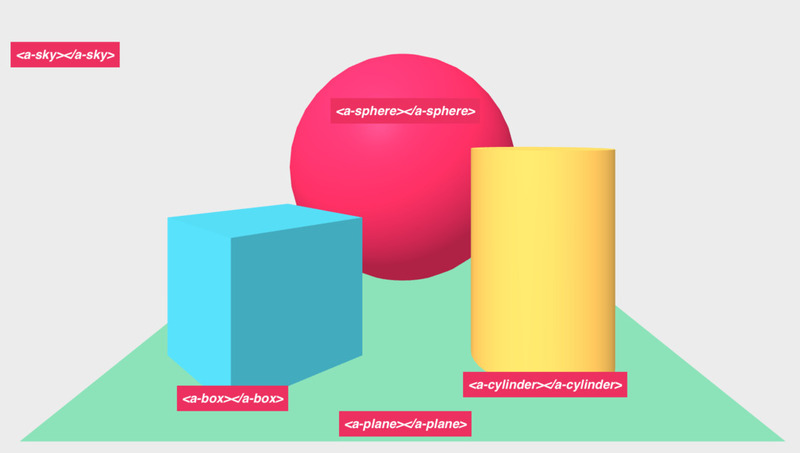 Underneath, A-Frame is an entity-component framework for three.js that is exposed declaratively. A-Frame provides a handful of elements such as <a-box> or <a-sky> called primitives that wrap the entity-component pattern to make it appealing for beginners. At the bottom of the documentation navigation sidebar, we can see every primitive that A-Frame provides out of the box. Developers can create their own primitives as well. Below is the Hello, WebVR example that uses a few basic primitives. A-Frame provides primitives to create meshes, render 360° content, customize the environment, place the camera, etc. <a-box> defaults the geometry.primitive property to box. And the primitive maps the HTML width attribute to the underlying geometry.width property as well as the HTML color attribute to the underlying material.color property. Primitives are just <a-entity>s under the hood. This means primitives have the same API as entities such as positioning, rotating, scaling, and attaching components. // The mesh mixin provides common material properties for creating mesh-based primitives. // This makes the material component a default component and maps all the base material properties. // Preset default components. These components and component properties will be attached to the entity out-of-the-box. // Defined mappings from HTML attributes to component properties (using dots as delimiters). // If we set `depth="5"` in HTML, then the primitive will automatically set `geometry="depth: 5"`. For example, Don McCurdy’s aframe-extras package includes an <a-ocean> primitive that wraps his ocean component. Here is the definition for <a-ocean>. // Attaches the `ocean` component by default. // Defaults the ocean to be parallel to the ground. // Maps HTML attributes to the `ocean` component's properties.